Many “baby boomers” are in retirement crisis. Are you one of the many retirees that doesn’t have enough income to live comfortably in retirement? Baby boomers are the generation born between 1946 – 1964. Is that you? 10,000 baby boomers are retiring every day and have not prepared for the “golden years”. Due to lack of steady employment, insufficient planning and no company retirement, since many companies began dropping pension programs, many retirees have a very limited retirement income. Three-fourth’s of Americans between 55 and 64 have less than $30,000 in savings stashed away to help with their retirement expenses. It will be hard to survive on that. Not including cost of living increases each year. Hopefully Social Security will be around for many years to come, but that’s debatably. Most baby boomers will rely on savings rather than pensions plans which are becoming non-existent. My father worked for a big company and received a very nice retirement income. That’s not true for many people today. Fortunately, a large portion of boomers are still very healthy and want to be where the action is. Which could be working part-time, watching the grandchildren, dog walking, handy man or woman, school busdriver or other useful tasks. Most retirees have sharp minds, plenty of energy and want to keep busy. Plus, the challenge of still being productive appeals to them. Entering retirement years with debt is very nerve-wracking, especially with the thought of increased medical bills and other increased expenses, like food, health insurance, entertainment, housing etc. So, what is the solution? Now, thanks to the internet, there is a viable solution to your money problems. Without leaving the house, without pulling out your credit card, you can earn money to supplement and help pay those extra and unexpected bills. Plus, if you embrace this training, there is a good amount of money to be realized. There is very little out of pocket money to be spent upfront, in fact there in no charge to join. Totally free, no credit card required! So, let me explain affiliate marketing. It’s the process of starting a website, putting articles on it relating to different products. This category is called a niche. A niche is an interest. For instance I like to cook and bake. So a food blog would be something that I could write lots of articles about. Then by putting affiliate links in that article for different tools I use in my cooking or baking article, such as a blender, a wok, or even a set of pans, if someone clicks that link and purchases that product I will receive a commission. You have your own affiliate link. You add a link that connects to different sites like Amazon, where the product is for sale. For an example, if you are familiar with golf and can write about it, you can capitalize on it. There is a site called Clickbank, which promotes digital products that you can promote. How to improve your golf swing is a popular one and your commission is around 75%. That’s just an example of one of the many choices available. You can promote a specify golf club, golf shoes, or a golf bag on Amazon, the possibilities are endless. The sky is the limit. Just remember to chose your niche with the idea in mind that you will be writing many articles about this subject. It’s good to have a lot of knowledge about your subject, as it will make it much easier, because you will be doing a lot of articles pertaining to that topic. That being said, it is a little more complicated than my simple description. But it is fairly simple to do once you learn the process and then follow the instructions. You don’t need to be a computer whiz either. When I first got involved in affiliate marketing I didn’t know how to copy or paste, but I’ve certainly learned a lot of computer skills in this program. If a retired hairdresser can do this , so can you. Perhaps you tried affiliate marketing before without any success? Most likely it was a scam, as there are so many out there and they do know how to make it sound inviting and simple to achieve success, plus get rich quick. Wouldn’t that be great! In this program there is work and time involved to learn this. It’s not a get rich quick scheme. You will work hard and there will be some failures along the way, but you can achieve success and it is well worth it. Look at the world of sports, like pro football. Do you think Tom Brady was born knowing how to play football. No, it took years of practice, hard work, dedication and patience. He still has a very strong work ethic, as do most athletes. Well, the same with affiliate marketing. It takes hard work, determination and a desire to succeed. And what a sense of accomplishment when you do succeed. But it can be done and plus you can try it for FREE. Yes it’s true, you can get started for free. As shown below, if you choose the “starter plan” $0 per month choice. You will get instant access to this great community after you enter your sign-up details. Yes, you will need a website to build a successful business and yes, you will be building a business. Don’t be nervous about building a website. Today it is very easy to do, with the proper help. Here, I’ll show you how to have a website up and running in a very short time. This is what you will receive for free! Personal help from me and other community members, over 1 MILLION. That’s right, 1 MILLION! Two free websites that are functional. All of the above for free to get you started. The best training around and it’s all FREE. There is also an upgraded version called Premium which gives you access to much, much more. Plus it only cost about $1 a day for the upgrade. Read my Wealthy Affiliate review and see if it’s something that interest you. Get started online here in a few minutes. Here is what you receive for free. Read my full review of Wealthy Affiliate here. If you have any questions, please leave a comment below and I will be sure to get back to you as soon as possible. Don’t be afraid to ask. I will be here to help you get started. Thanks, Deanna. To your future success! I’m sorry, I’m a boomer and I have no sympathy for those who don’t have enough to retire on. We were privileged to enjoy economic expansion that was unprecedented after the second world war. When I was young there were so many jobs and opportunities to make a living. It’s a lot tougher today than it was for the baby boomers that’s for sure. Why are people so financially dense? I just don’t get it. You have to go out and make your own luck, work hard and move to where the money is. Always follow that. I like that you’re getting the information out to the baby boomers. But unfortunately, many born after 1964 can use this information as well. Not many people can save due to the economic expenses. Not all of us are born with silver spoons in our mouth, we all have to work hard. 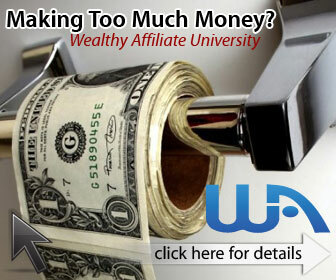 Wealthy affiliate is a really good platform. Great review. Yes Jagi, It’s unfortunately that many people today cannot retire comfortably. But the light at the end of the tunnel is that money can be earned with very little start-up costs and you can work from home. Thanks, for your comments, Deanna.